Philatelic Literature & Research has focused, for obvious reasons, on philatelic libraries and research libraries with significant philatelic collections. Sometimes, though, the philatelic researcher must look beyond the usual places. Earlier this month, while attending the Special Libraries Association Annual Conference, I had the opportunity to tour the map collection at the Free Library of Philadelphia. 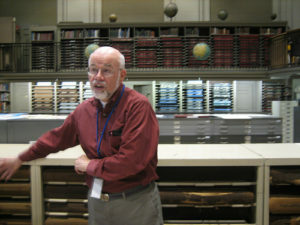 Richard Boardman, head of the map collection, showed us some of the maps in the library’s collection, which is particularly strong in maps of the Philadelphia region. Following the tour, I asked him if the library had any post route maps, and was rewarded with several maps that the APRL does not have. Most of the map collection is not included in the library’s online catalog, and this is probably the case at many libraries. In order to find treasures like this, you need to contact the librarian and tell them what you are looking for. You will probably also need to travel to the library to do your research if the materials do not circulate and have not been digitized. If materials do circulate, you may be able to request them through interlibrary loan at your local library. What other kinds of materials might you find at non-philatelic libraries? Federal Depository Libraries have government documents collections that may include Post Office Department documents – as well as documents from other government departments that may be relevant to your postal history research. Public libraries are often good sources for local newspaper archives, city directories, and other local history resources. Does the library have a post card collection? Or other correspondence? These materials might provide a look at interesting stamps, franks or postmarks. I would like to wholeheartily agree with Beth. I volunteered in a historical museum and library in Florida where I came across many envelopes and postcards that were kept from tax records and other correspondence. It was a treasure trove of small town DPO’s, Doanes, 4 Bars, and other very rare postal markings, some over 100 years old! The museum had no idea what they had. Now they are properly archived and put in albulms for all to see and research. You just never know what you’ll find and where. That’s what makes this hobby great.